I succeeded in getting the (better) ivtv framebuffer driver working, but my previous impressions of the mpeg were wrong. Still looking choppy, and to top it all off I wasn’t getting any frequencies to work. Harrumph. This has taken way, way too long. I should stop using such old stuff, depending on my further research to progressively move things slowly forward to more stable and reliable versions. 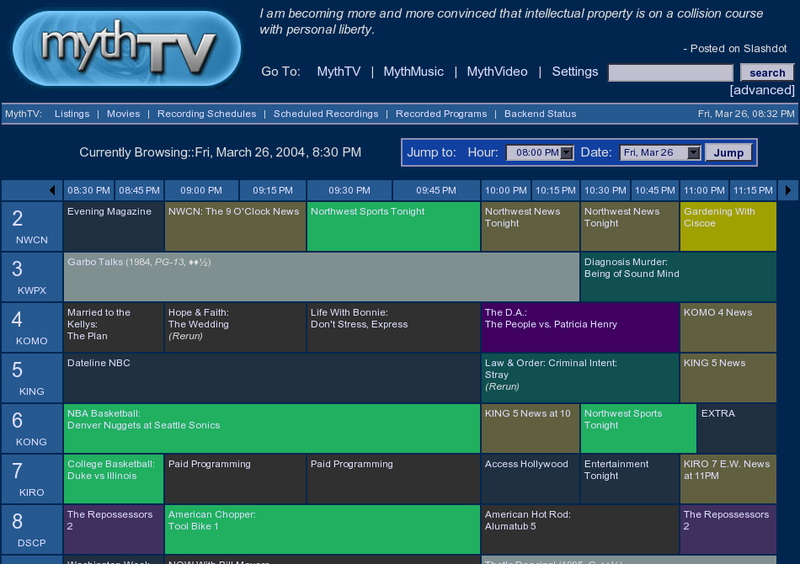 I found a cool writeup by Jarod Wilson of how to set up MythTV on a system running Fedora. I’ve already got Fedora Core 2 on CD on the shelf in the office, so I think I’ll bail on the KnoppMyth idea for now and give those instructions a run with a fresh install. I’d even been considering doing Win98 + the software bundled with the card to qualify the card as functioning correctly, but then as I was passing the Wasters in the Fourth Great Circle of Hell I pulled myself out and came up with an alternative that I can live with. Next update will be the initial results of doing everything under Fedora, based initially on Jarod’s notes. Fingers crossed. Only by reading thru some messages in the forum on SourceForge did I discover that the 0.1.9 version released January 13 2004 isn’t the actual stopping point in development. Over at ivtv.no-ip.com are the real ongoing copies, including 0.2.0-rc3 from December 12th and an alpha-level (I presume) version 0.3.0. WOW. Its install.txt file even concurred with something I’ve read elsewhere: ivtv shouldn’t need any special parameters for its module anymore. It should figure out my system’s PAL nature, among other things. resulted in about 6 seconds of snow when I watched it on another machine. No sound yet either. However, it had consistent snow, no frame loss that I could see. Oh, hope of hopes. I’ll add a channel, give it a try, and report back. Later today I’ll try to write up the details of exactly what I’ve done and how I put the new version in place on top of the KnoppMyth I’m running. But I wanted to at least share this positive news, and the detail that isn’t yet appearing on the SourceForge project page or even on the ivtv parent page. A real shame when you figure there have to be plenty of other people suffering the way I am—including one person who wrote me just this morning. There’s also a coax cable coming from a separate box on the wall for NTL digital cable. That line goes to a small splitter where the guy who installed it made the signal both go to the regular (fly plug it’s called?) plug on the TV, and also to the input on the NTL digital cable box (made by Pace). Fine, I made the tv-box’s cable plug into that little splitter for its input, instead of the wall. Tried the tv-box’s cable now into the TV again, and voila, a nice crisp picture. Hmm. Died at /usr/bin/tv_grab_uk_rt line 257,  line 4. Maybe a bug? Fine, I’ll get the latest version of the script to see if it fixes the problem of not listing the channels matching your search string, like the previous KnoppMyth-included version did. I have to first install CVS since KnoppMyth doesn’t include it by default: apt-get install cvs. When it asked about location of the repositories, I left the /var/lib/cvs default and on the next screen, chose ‘ignore’ to not worry about not having any. Also told it to not enable the CVS pserver. Great! Looking at the diff between the versions, I see that the tv_grab_uk_rt script is now calling ask_choice instead of ask about which channel to add. That was the fix so it now properly lists the matches for ‘BBC1’ or ‘RTE1’. which has me curious since one of the sites yesterday had a comment about making it understand that it’s getting a full two weeks of information in the radiotimes.com output now. Perhaps I need to rebuild mythfilldatabase to make it understand that? Yeesh. error. Oh well, more tonight maybe. Heh, this is a blog catagory turning into a ChangeLog. and it correctly lists the shows on tonight on both RTE1 and TV3, the two channels I’ve added. It turns out all attempts to use ‘tv_grab_uk_rt’ as included in the KnoppMyth R4V4 that I installed are going to fail. I came upon notes both on the MythTV Users list and the XMLTV site. It turns out radiotimes.com, the site used by the perl script to get airing information, started to block the User-Agent that the script was using to identifying itself. But they were really cool—instead, the’ve put the information for the next two weeks available in raw XML format. In the mythtv-setup Channel Editor, I’d thought I was so clever figuring out that I had to put 231 in the ‘XMLTV ID’ field for RTE1. Those identifier errors above helped me realize that it was searching based on the first field in that file, so now the ‘XMLTV ID’ should be the server name, like rte-1.rte.ie for RTE1. Fine, I fixed both RTE1 and TV3. Some more swimming with Google and I found a discussion talking about exactly this problem. I went into the Channel Editor, and for both RTE1 and TV3 I changed the “Channel Number” and “Frequency ID” entries to be A11 for RTE1 and A9 for TV3 (based on what was in the pal-ireland file I mentioned earlier). The fundamental change being made with this was that my channel number of “1” for RTE1 and “3” for TV3 seem really wrong after reading all of these sites, including this most recent discussion page. Having the frequency entry in both fields may be correct, but there’s no obvious change yet. I just tried looking at either channel, and they’re both snowy and hard to see. Though I’ll admit the RTE1 channel has more color and movement on it compared to the grey/white mess that was there before. TV3 looks the same as it did. Wonder what I’m missing? That’s all right—the fact that it’s getting the show information is a big positive step for only a little amount of effort today. Last night I spent some time wrestling with trying to tune in a channel but no luck. MythTV has a ‘FrequencyID’ part of the channel page under mythtv-setup, but I’ve not yet verified what it’s supposed to be. I tried putting in the frequency for RTE1 that is shown on the NTL Frequency List. That didn’t quite do it. With a little digging, I then discovered /usr/share/xawtv/ and next tried “ptune.pl -f pal-ireland A6“. Almost! It showed a snowy picture of what I later found to be TV3 with a football match (soccer). But it was really hard to see, and more interestingly it was moving in bursts. Like the system couldn’t keep up with it and was dropping frames. Hmm. 2004-10-19 19:15:07 Running as SUID root would allow some threads to run with realtime priority, improving video smoothness. Ok, that tells me the tuner type. That matches the PAL_I sticker on the replacement PVR-350 card that I got the other day. A step closer? but that seems to contradict the suspected value for IVTV_TUNER. Gahh. Time to read more sources I think. There’s lots of good stuff under /usr/local/lib/ivtv. I think when I’m all done and have this actually working, I’m going to create my own HowTo combining the efforts of the others, but also including links to example files for everything. And then pitch to have those included in some future release of mythtv. If everybody wants lots of people to be able to use and enjoy this cool stuff, there are still a few things past the great KnoppMyth packaging that have to happen. At least, for anybody who’s not in the US. Wouldn’t it be cool if KnoopMyth let you choose (or even click on) where you live, and have it auto-configure most of the stuff that really doesn’t need to be done manually? And no command-line mythfilldatabase invocation?